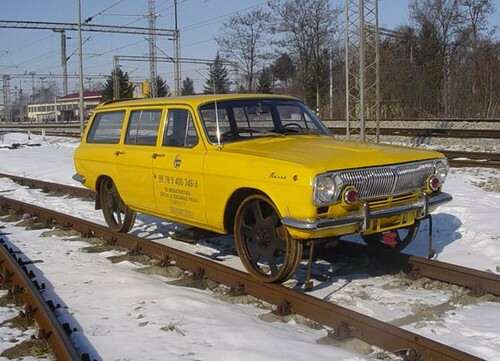 Often referred to as "Hy-Rail", or "Hi-Rail", these dual purpose vehicles (able to travel on rails, as well as highways) can be fascinating to both train geeks and car collectors. The liberating idea of putting your car to rails, when the road ends or ceases to be an option, is good news to any off-road enthusiast. What's more, the cool looks of some extremely rare vintage conversions may stir some childhood memories and maybe prompt you to spot the surviving ones and restore them. 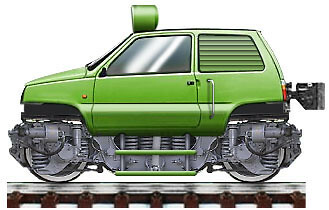 Road-Rail Vehicles use a combination of standard and flanged wheels (which could be raised or lowered), and are widely used by railroad companies to inspect the tracks, or drop off workers and equipment. A special hi-rail Western Star utility truck, Ontario, 2000. Similar rail-buses were employed by County Donegal Railways, in Ireland. See their interesting collection. The RGS No. 2 Spruce Goose at the Colorado Rail Museum. 1958 Pontiac Station Wagon Hyrail used on Canadian Railways. There is another way to engage in railway sight-seeing, without sacrificing any of the comforts of your... recreational vehicle. This railroad marvel has DM62 locomotive engine set on top of ballistic rocket mobile wheeled base "Hurricane". It was built not too long ago, in 2002 by the students of VNIKTI institute in Bronnitsy, Russia. Scooter on rails, pretty straight-forward concept. Looks fun, though. However, make sure you know the local train schedule before you bring your whole family to the tracks. We are trying to be open-minded about this new transportation concept from Russia, but still have hard time believing they really mean it. 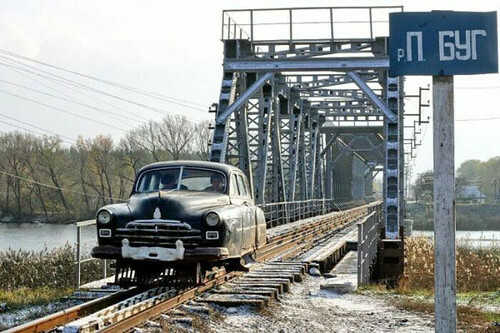 Yet, according to this respected source, "Wire"-balancing trucks could be soon a reality in Siberia, and the similar 3 kilometers system is already under construction in Kiev. The Road/Rail converted trucks will travel between existing high-voltage towers high above the frozen landscape, avoiding the costs associated with building on permafrost and huge snow-removal expenses. Eventually the wire-transport system will get their own custom-designed cars, capable of reaching the speeds of 500 km/h. But for now the all-purpose Russian (indestructible) trucks are going to become airborne and roam above the trees, scaring local birds and occasional hikers. 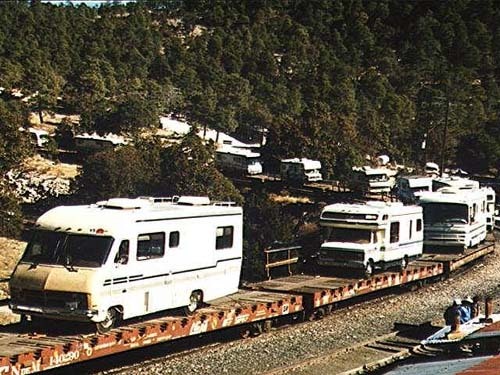 On your Copper Canyon photo, when my family came down from Alaska in June of 1965, we drove from Anchorage to White Horse, Yukon then put our Volks camper on a flatbed railcar of the White Pass and Yukon Route railroad to Skagway, AK. It followed the GoldRush Trail of 1898 through the mountains and in place you could still see the steps worn into the rocks. The RR is running again but only to the Canada border from Skagway. Your 1961 Ford Fairlane Hy-Rail is actually a Checker Marathon, of indeterminate age because they never bother to change the styling. Back in the '70s I discovered that my '49 Ford pickup could ride the rails by slightly deflating the bias ply tires. Her creeper gear allowed us to leisurely cruise abandoned rail lines at 5 to 10 mph. The great thing was that it required only minimal attention from the driver.I only wish there was a system in place allowing us to similarly travel the highways. I would gladly give up some control of my vehicle in exchange for being able to pay attention to the scenery, or the newspaper, or my co-passengers. Don't forget the "Rail Scooter"
Sorry for the small pic, there are bigger ones available, but this exact pic is the only one around where I live. Thank you, i added some more info. Terrapin, you don't have a picture of this, by chance? To your "Truly a Light Rail Vehicle" i can say that the first and third are Simson Schwalbe KR51/1 (aka Simson Swallow) build in the German Demokratic Republic. The second is a Simson Star, also build in GDR. About that Volkswagen Bus: This is not some sort of "homegrown" conversion, they were produced in series equipped this way. The German railway company Deutsche Bundesbahn ordered some dozens of these (about 60 units, iirc). Some of them still roam around at several transportation museums or historic railways. Where's polish car "Mitor" vel. "twin Żuk"? The german so-called "Schi-Stra-Bus", the red bus shown on the pictures courtesy of mibaone.de, was not only used between the towns of Siershahn and Montabaur. 15 of these were brought into use in 1953 and 1954. They were used on several routes, partly on rails and partly on roads, e. g. between Passau and Cham. However, most of the connections were cancelled by the late 50ies, early 60ies, since the conversion between road and rail was rather time-consuming (10-15 Min.) and improvements to the road-network made all-road connections more competitive. The last "Schi-Stra-Bus"-route, Betzdorf - Koblenz trough the Westerwald-mountains, lasted till 1967. One bus, the one shown above, is preserved. More information (in German) on site linked to my name above. nb the photo just after the "willys jeep 4x4" is ALSO a Willlys jeep 4x4. It's a "forward control" jeep. 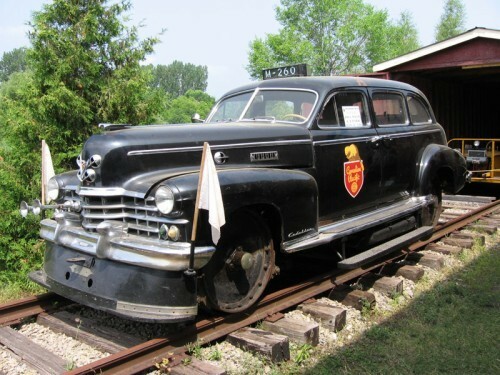 The William Glover photo of the 1951 Chevrolet track inspection car is actually from the Eureka Springs & North Arkansas Railway in Arkansas, though it is pretty close to Missouri. A spruce goose is an airplane, the D&RGW #2 pictured is the combination of a Pierce Arrow car body with a box car, and is known to the railroaders as a "Motor". This is evident by the 2 foot tall letters on the side that say "Motor"
To rail fans and the people of Colorado these marvels of necessity are called a "Galloping Goose"
After D-Day during WII, the US military used jeeps as locomotives, and I think I have seen the same use during the same period in Burma. The second picture of the '55 Chevy Bel Air is very interesting, because the boxcars in the background have buffers. So the pictures is most likely taken somewhere in Europe. That leaves the question, if the car was used by a european (state) railroad, or by the United State Army Transportation Corps? These last photos of a Russian Army "URAL" truck probably are the tests of "Unitsky's String Transportation system". Possibly it might use hi-voltage wires as a string/rail, but on the polygon these things are only tubes. Here's the link to their site. http://www.unitsky.ru/ (translate yousing google translate, yeah). Also I'm quite sure, that these photos with a truck were not taken in Siberia, because the only testing polygon was in Ozery (South east of Moscow district, not far from Kolomna). I visited it in 2009 with a friend of mine, it was ruined a bit... I think there is no studies of this system now... Also Dr.Yunitsky is not very popular in Russian Scientific Society... So I don't thing that someone in Russia would like to give money for this. Thank you Evgeny, great material, will include in the next part. 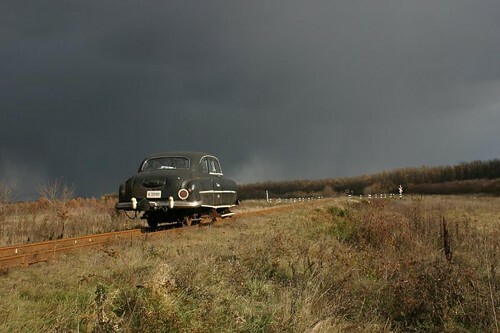 That 1955 Chevrolet sedan appears to have been photographed in Soviet Russia, of all places.